Back in the day Elon Musk was well-known for being one of the co-founders of PayPal. Today, the former Internet entrepreneur is tackling no less than electric cars, solar rooftops and rockets. 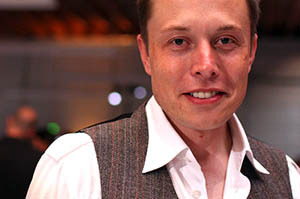 He’s the CEO of both Tesla Motors and SpaceX, as well as the Chairman of SolarCity. The way I see it is that all transportation will go electric except for rockets, ironically. All that is needed is someone to provide compelling electric vehicles. That is something we’re doing at Tesla and that’s something I think we’ll see the rest of the auto industry doing over time. I don’t think there is such a thing as the electric vehicle market and the internal combustion market — it’ll all go electric. It’s just a question of producing a compelling product. Currently for electric vehicles, there isn’t a problem with demand, there’s only a supply limitation. As many compelling electric cars that can be made will be bought. It just takes time to get them made. People have the wrong idea of there being an electric vehicle market and also a gas car market. It’s just that if you want to buy a compelling electric car right now there are very few options. You’ve got the LEAF, with an effective range of 70 miles, which is not very practical. And you’ve got the Volt, which has an effective range of 35 electric miles plus the gas miles, so it’s not super great as an electric car and it’s relatively expensive for a car in that range. The Tesla Roadster is expensive and impractical for most people. 2012 is a big year for Tesla. It’s really just a matter of refining the engineering of the Model S. We’re down to the final brush strokes at this point. The most important thing for us is to get the manufacturing online. We’re trying to get to a 20,000 unit per year run rate as soon as possible and we’ve committed to start deliveries to customers no later than July. I feel very confident of meeting that date. Then we’ve also got a big event, on Feburary 9th, which is the unveiling of the Model X. I think that will be very well received. The biggest effect that Tesla will have on the market is being a good example for the overall car industry. We can show the industry that if you make cars that look good, have good performance and long range then people will buy them. With the Roadster we spurred GM to create the Volt, which Bob Lutz has been kind enough to acknowledge. The second effect will be the sector effect. Through the cars we make and the power trains that we supply to others. The fully electric RAV4 will come out the middle of next year, or whenever Toyota wants to bring it out, and that’s going to be the best mass market electric vehicle out there. We’re making the whole power train, motor, battery pack, inverter, and charger and all the software. I think we’ll also see steady improvements in battery technology. In the case of the Model S, it’s less than half the cost per kilowatt hour of the Roadster. So we’ve made a huge improvement there and the range has increased and the efficiency has improved. I think we’ll continue to see an improvement in the cost in battery energy maybe 7 to 9 percent per year. That may not sound like a lot, but if you compound that over several years it becomes very significant.